IR windows allow for viewing electrical switchgear through safe ports. call 800-248-SCAN or email info@stocktoninfrared.com. 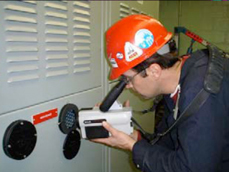 Standards compliance: the equipment maintained in an enclosed and guarded condition without creating a potential electrical hazard during inspection. 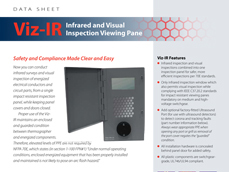 Therefore elevated levels of PPE are not required when using an IR window. Safety: the non‐intrusive inspection does not elevate the risk of electrocution or of triggering an arc flash incident. Risk management: the Hierarchy of Control requires engineers and managers to eliminate risk where possible (as opposed to relying on engineering controls or PPE to protect personnel after the accident happens). Use of IR inspection windows eliminates the high‐risk behaviors involved with open‐panel inspection and replaces them with a non‐intrusive work process. Data management: IR windows provide a systematic approach to data collection during inspections – same target, same location, same angle, and same distance. Consistency in the data collection process leads to more trendable data in any PdM process. Cost savings/efficiency: using infrared windows has been shown in time studies to eliminate over 90% of the time involved with inspections. And after all… time is money.